April is Autism Awareness Month but we’re aware of Autism 365 days a year in our house. Our home is a busy one by any standards. We have four boys within a five year age range, three dogs, two cats and four hens. Gerard and I both work full time, Gerard as a truck mechanic and me as a secondary school teacher. I commute 40 miles to work daily in Monaghan. Gerard drops the boys to school & works through lunch so he can collect the boys from school at 3 and drop them to our marvellous child minder, Caroline. In the midst of all this chaos, we have to have something to anchor us. We have a tight family bond and get great enjoyment from spending time together with our pets. I always had a dog when growing up in Dun Laoghaire. I have great memories of Pepi, Rex and Max from the 70’s and 80’s and within weeks of getting married in 1996, we had a puppy. We have had anything up to four dogs at a time since and loved them all but only a few leave an indelible mark on your heart. Monty, a lovable, loyal Border Collie that we had for 11 years was one and Ruby, our black Lab who can look right through to your soul is another. Ruby ended up with us by chance. She was born into a litter bred by a friend of mine, Katherine, whose husband wanted to breed some hunting dogs and they just wanted good homes for the others. We went to pick one of the puppies in 2008 but we didn’t pick Ruby. We picked her brother, Rocket. Rocket was a great dog but he got suddenly ill one Friday evening early in 2011 and was dead by Sunday. He had developed an auto-immune disease and his organs failed. The boys were devastated as he was a dote. A short while later, Katherine let us know that one of the other dogs from the litter needed a new home. I decided it was meant to be (much to Gerard’s dismay at the thought of another dog – a pattern repeated over the years) and we picked Ruby up. When she came to us first, she was a very timid creature and wouldn’t come down from the bank at the back of the house. She ran away from human contact and was very afraid. She hadn’t been a family pet so wasn’t used to children either. Thomas, our third son, is animal-mad and bit by bit, coaxed her down from the bank, slowly getting her to come near him at first and eventually working up to hugs. The hugs were here to stay. She has to be the most-hugged dog in Ireland. Thomas had huge issues settling into pre-school and a few things set off alarm bells for Gerard and myself. We had him assessed for Aspergers Syndrome in 2009 but it was inconclusive at that stage, in spite of our worries and experiences with him. We carried on for a few years but eventually things came to a head and we applied for assessment again in January 2013. He was diagnosed with Asperger Syndrome in June of that year. He has another assessment since that and been diagnosed with Autistic Syndrome Disorder, as the diagnosis of Aspergers Syndrome no longer exists according to the diagnostic tests that are used as a worldwide standard in this area – the umbrella term of Autistic Spectrum Disorder covers everything, apparently. Ruby has been an immense help in all of this. [pullquote_right] Thomas has problems with social interaction but is completely at ease with animals as they are so non-judgemental. [/pullquote_right] He lies for hours with his arms around Ruby and she genuinely hugs him back. She is quite content to just stay in his company; she doesn’t expect anything of him except love and he gives that unconditionally. As Thomas’s world got more confusing to him and demanding of him, his anxieties escalated. This is a huge issue as it affects every facet of his life. When he became overwhelmed at home, and had meltdowns or shutdowns, Ruby was the only thing that made a difference to his internal thermostat. Ruby’s entry into the room where he was changed the status quo completely. She would nuzzle him and a smile would start on his face or she would stick her nose in towards him and start licking him which led to his giggles. Within seconds, the atmosphere changed completely. We go to Wicklow for the summer to spend time with my family and Ruby has to come for the seven or eight weeks too. She is one of the family and an extremely placid, docile dog. Last summer, we discovered that she had gone blind in one eye and she is now losing the sight in the other. Thomas was inconsolable at first, but then came around to the idea as it meant she had to be a full house dog and needed him more than ever. 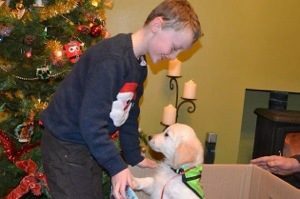 Due to the amazing bond that Thomas had with Ruby, we felt that he might benefit from an Autism Assistance dog. This would mean that the dog could accompany him anywhere we went and would help calm and reassure him. Some of the charities that provide these dogs have had to close their waiting list due to demand and others have years of a waiting list. [pullquote_right]We felt that going the puppy training route with My Canine Companion would suit as Thomas could form a bond from the very beginning with a pup. [/pullquote_right] We sent off our application form in the hope that we would have a pup by the summer of 2014. 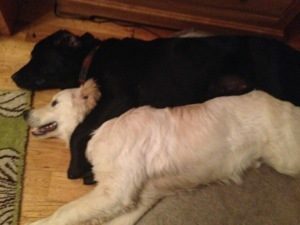 We were completely thrilled when we got a text in December 2013 telling us that there was a Golden Retriever Puppy ready for us. Our gorgeous pup, Potter, who began working his magic from the very beginning, came to us ten days before Christmas. We put a big cardboard box, covered in Christmas wrapping paper with a big red bow on top under the Christmas tree and told Thomas we had a surprise in the box for him. He was so amazed when he opened the box to see the bundle of fluff that was his new companion and confidante. It was love at first sight for both of them. Some family members, who knew of Thomas’s bond with Ruby, wondered how Thomas would cope with the idea of loving another dog as much. He took it all in his stride. Lots of mothers of one wonder how they will love their second child as much as their first but their heart always has room for more. Thomas stayed loyal all along. He calls Potter “the best Assistance Dog in the world” and Ruby “the best house dog in the world”. There are enough cuddles and kisses for both. Potter goes to all of Thomas’s activities and all of his outings with him and is very well behaved. He just sits and wait until it’s time to move on. He’s there as reassurance and Thomas loves giving him cuddles every now and again. He’s been to swimming lessons, karate, clinic appointments, arts & crafts, dentist, cinema, Armagh Planetarium & lots of restaurants and shops. [pullquote_right]Before Potter came to live with us, Thomas hated going into shops and got very upset when he had to but now he manages a lot better. [/pullquote_right] Potter even helped him pick his shoes for his Communion last weekend. Thomas has a lot of sensory issues with his feet so socks and shoes are a big deal. Usually, picking shoes was a nightmare for him but this time it went great. Potter and Ruby now share a symbiotic relationship of sorts. Potter has enough youthful exuberance to rejuvenate Ruby who enjoys their play more than I thought she ever would and Ruby has enough solid dependence and maturity to have a calming effect on Potter. At the end of every day, Potter and Ruby lie in front of the fire and Thomas lies beside or between them, hugging them and telling them about his day. He usually finds it hard to talk to people but he tells them all of his secrets and knows they’re safe. Next year Potter has to go back to Cork for 12 weeks of intensive training and then he’ll be a fully qualified assistance dog. I know that Thomas and the rest of the family will miss him a lot but it will be worth it because he’ll come back so well trained and mature. Ruby will be on double cuddle duty then and will take it all in her stride. Hopefully, now you will understand why we were so devastated when she wandered off and was missing for three nights. Her bad eyesight led her to being disorientated and she couldn’t find her way back home. We had alerts all over Facebook and Twitter and had great help from everyone in getting the message out. Thankfully, someone just a mile or so away found her on the fourth day and put a photo on Facebook which led to some other people in the area identifying her as our Ruby and led to her coming home yesterday. She will never be let out alone again!! So our Ruby, a precious gem in a dog’s disguise, has led to so much joy, awareness and understanding. Her loyal and stoic bearing has taught us so much and brought so much love.